Small Business Server 2000 is a BackOffice-based solution for small businesses running 50 client computers or fewer without a full-time technology professional on staff (talk about a ready-made opportunity for MCSE consultants!). It’s been priced aggressively to fit the small business budget, with five-user configurations starting at around $1,500. You might be interested to note that the 50-client computer limit really understates the capabilities of SBS. If you’ve worked with small businesses, you know that many small businesses can have hundreds of employees, but fewer than 50 client computers. An Alaskan fishing company based in the Seattle area, counting seasonal employees, had a full-time head count approaching 1,000 people at times. However, it only had 25 client computers in a relatively small office, making it an ideal candidate for SBS. The other employees were on the boats in Bristol Bay, Alaska, and other out-of-the-way spots like the Bering Sea. It’s important to understand that with the release of SBS 2000 and BackOffice 2000 Server, MCSEs in organizations of all sizes can now truly say they have more in common than keeps them apart. How can that be, after an era where SBS was so dramatically different from any other Microsoft server solution? Simple. The development teams are essentially one and the same for these releases. Not surprisingly, the functionality of both products is largely the same, if you ignore a few differences in applications that I’ll explain in a moment. If you learn the Administrator Console in SBS, then consider yourself knowledgeable about the one in BackOffice 2000. More importantly, if you learn one of the products, you can leverage and be successful with the other. This is good news. MCSEs serving MORGs can easily scale down to serve small businesses. More importantly, MCSEs working with SBS can more easily scale up to pursue work from MORGs. My suggestion for rookie MCSEs looking to break into the world of MORG and enterprise-level consulting would be to consider starting with SBS. By learning the bundle of BackOffice applications and Windows 2000 Server in small-business environments, you’re bound to have a gentler learning curve and gain your confidence before joining in the big leagues. Any mistake you make early on at SBS is valuable learning without hurting a large company (not to say you should go out and necessarily hurt small companies either, but you get the point). This strategy of playing farm ball to start is consistent with how many consultants break into the profession. Once you have a few clients on the reference sheet from the SBS community, you can land your first MORG engagement, ultimately leading to enterprise-level gigs if that’s your direction. SBS 2000 contains the same applications as BackOffice 2000 Server — Windows 2000 Server, Microsoft Exchange 2000 Server, SQL Server 2000, ISA Server 2000, shared modem and fax, and wizards and consoles — with two exceptions. SBS 2000 doesn’t include Host Integration Server 2000 or System Management Server 2.0. Why? These two components fit better at the MORG-level. Small businesses running SBS 2000 rarely have mainframe or mid-range hosts. There are also a few subtle differences between SBS 2000 and BackOffice 2000 Server, one obvious and the other nearly hidden. 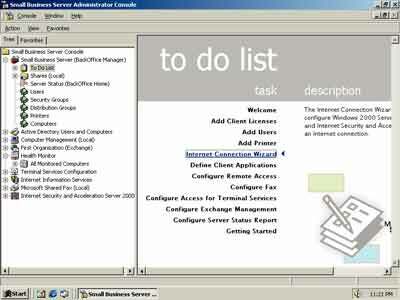 The SBS 2000 To Do List (see Figure A), accessed via the Small Business Server Administrator Console, was developed to be more friendly than both the BackOffice Server 2000 To Do List (see Figure 5 in "Resizing BackOffice) and using tools in the Administrative Tools folder such as Active Directory Users and Computers. Figure A. The SBS 2000 To Do List offers more options than BackOffice Server 2000. Figure C. ...while BackOffice 2000 has no such POP3 Gateway capability. Add a Windows 2000 user account to Active Directory. 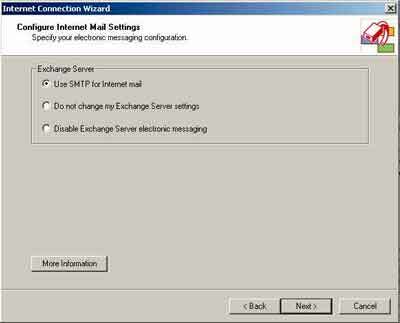 Add an Exchange Server mailbox for the user. Add the user to both security and distribution groups. Deploy software on the user’s client computer. The SBS team developed the Microsoft Connector for POP3 mailboxes for Exchange Server tool to fill a critical gap in Exchange 2000 Server. This tool translates existing POP3 email into Exchange-based e-mail that’s stored in the Exchange Information Store (IS). The SBS development team found that small businesses, prior to the implementation of SBS, typically used dial-up POP3 accounts such as harryb@nwlink.com. Because Internet identities are hard to shed, these small businesses aren’t willing to part with POP3 accounts after the introduction of SBS 2000 (and Exchange Server-based e-mail). So the POP3 gateway allows small business users to keep their POP3 e-mail accounts indefinitely. 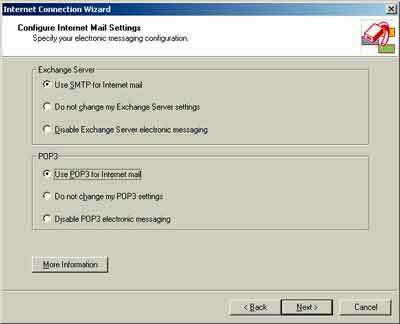 You might have noticed another interesting email implementation scenario in Figures B and C. You can configure Exchange 2000 Server under SBS 2000 to support both the POP3 gateway and the native SMTP e-mail capabilities. Why would you want to do this? Because when SBS 2000 is introduced into an environment that previously relied on POP3 e-mail, and has thus built up a significant Internet identity around the existing POP3 e-mail address, a reasonable transition period is required to introduce the native SMTP e-mail address. In other words, much like moving to a new house, you need to inform (and then enforce upon) everyone that you have a new address. One of the strongest reasons to consider SBS 2000 (when appropriate) is because of its improvements in reliability. The first release of SBS (named version 4.0) had some bad mojo working on it. Not everything worked correctly when it came to the SBS Console and its wizards. Hardware restrictions were bothersome, such as the modem requirements. This has all changed in SBS 2000. The underlying Windows 2000 Server installation uses the same installation steps as you’d use at the MORG and enterprise level. The modem and other special hardware requirements are gone. In short, some of the “BS” has been removed from SBS, making this product much less mystical and much more practical in its latest release.